Features enzymes derived from natto, a traditional Japanese fermented soybean dish to support cardiovascular health. Nattokinase, an all-natural fibrinolytic enzyme, is extracted from highly purified Japanese natto, and may support the body"s natural clotting and fibrinolytic processes. Researchers have studied nattokinase extensively in human and animal trials. These studies indicate that it may support healthy blood flow as well as aid in successfully breaking down fibrin, a blood clotting protein. NuMedica is a leading designer and manufacturer of natural and nutritional health supplements like Nattokinase. Its vast array of products is known for its safety and effectiveness. NuMedica has built its respected reputation on its extensive research and thoughtful product development. Get to know their offerings, which support many health and nutrition needs. Fermenting soybeans isn't something that many people in the West have thought about doing and adding to their diet. Yet this Japanese food may be one of the reasons the Japanese people enjoy such excellent cardiovascular health. Eating natto is beneficial because it has been fermented, which makes it easier for your digestive system to extract its nutrients during the digestive process. Natto is further beneficial for the digestive tract with its probiotic support. These fermented soybeans insert healthy bacteria into the gut where it can combat disease and inflammation-causing bacteria. While many say that natto is an acquired taste, you don't have taste to contend with when you take a natural supplement like NuMedica Nattokinase. Japanese natto can be an important part of your cardiovascular support system. By supporting healthy blood flow by breaking down clot-forming protein, natto can help keep you blood flowing optimally. If you have a history of bleeding or suffer from a condition associated with bleeding, natto is not recommended for you. 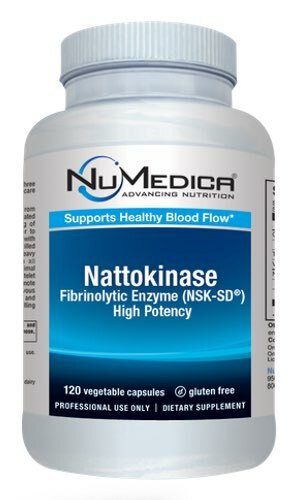 Healthy individuals looking to boost support for their cardiovascular system can benefit by taking NuMedica Nattokinase, which is also an excellent support for your digestive tract. 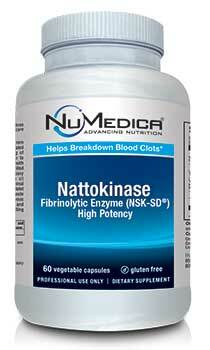 NuMedica Nattokinase - 60c 1 Capsule 60 Take one capsule twice daily or as directed by your healthcare practitioner. NuMedica Nattokinase - 120c 1 Capsule 120 Take one capsule twice daily or as directed by your healthcare practitioner. Other Ingredients: HPMC (vegetable capsule), MCC (microcrystalline cellulose), rice flour. Nattokinase (NSK-SD®) is the highest activity (20,000 fibrin units per gram) nattokinase produced. U.S. patented manufacturing process, patent application #20010046697 removes Vitamin K to prevent adverse interactions with warfarin. Caution: This product is contraindicated for individuals with a history of bleeding or with conditions associated with bleeding. Use only under the supervision of your healthcare practitioner, especially if taking anticoagulant or blood pressure medications.